Luton Town’s proposal to build a new ground at Power Court has received another huge boost this morning, with confirmation it won't be called in by the secretary of state. 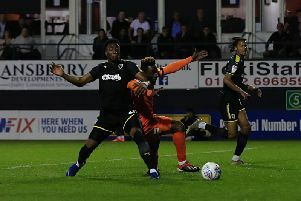 After the club were granted planning permission by Luton Borough Council earlier this month for the 17,500 all-seater stadium, a letter from the secretary of state for housing, communities and local government, James Brokenshire's department, which has been uploaded to the council’s website said: “I acknowledge receipt of the environmental statement relating to the above proposal. On hearing the news, deputy leader of Luton Borough Council and Portfolio Holder for Transformation and Regeneration Sian Timoney tweeted: “Pleased to hear that Sec of State has no comments to make on the APPROVED Power Court planning permission.